OHS senior Jade Anderson took home a top honor from a statewide speech and debate tournament on April 7. 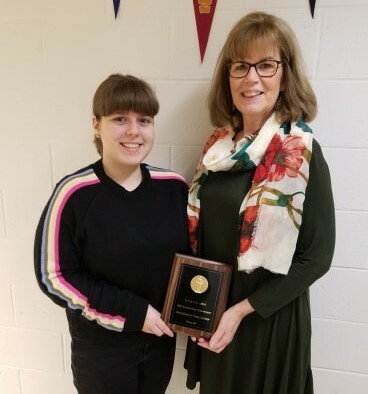 After qualifying for the state tournament at a previous local competition, Jade competed against hundreds of the top students from around the state, advancing to the semifinals and then the final round in the Program Oral Interpretation competition. The competition, held at Hofstra University, included students from 75 schools. According to OHS speech and debate coach Kathy Hardison, Jade is the first OHS student to “break” through to the final round at the highly competitive NYS Forensics League State Championship Tournament. Jade finished sixth in the final round of Program Oral Interpretation, which asks competitors to organize and perform a “program” of written works around a central theme. Jade also competed in Dramatic Interpretation, in which students perform a memorized interpretation of a written work. Jade will travel to Milwaukee over Memorial Day weekend to compete in the National Catholic Forensic League’s Grand National Tournament. Students from OHS have had the opportunity to compete at the national level every year since 2011.